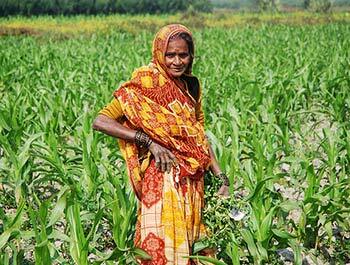 South Asian farm lands have been increasingly experiencing climate change-related weather extremes. A report from the Asian Development Bank in 2009 warns that if the current trends persist until 2050, major crop yields and food production capacity of South Asia will significantly decrease – by 17 percent for maize, 12 percent for wheat, and 10 percent for rice – due to climate change-induced heat and water stress. In response to this situation, USAID’s Feed the Future (FTF) initiative is supporting the “Heat stress resilient maize for South Asia through a public-private partnership” (Heat Tolerant Maize for Asia, HTMA) project to develop heat-resilient maize for South Asia. Launched in January 2013, the HTMA project builds on CIMMYT’s elite abiotic stress-tolerant maize germplasm base; the technical expertise of the key resource partners (Purdue University, Pioneer Hi-Bred and CIMMYT); the maize breeding and phenotyping locations and strengths of the national agricultural research systems of India, Nepal, Bangladesh and Pakistan; and the seed production capacity, strong links with the farming communities, and the market reach of private sector partners (Pioneer Hi-Bred, Vibha AgriTech, Ajeet Seeds and Kaveri Seeds) to develop and deploy heat stress-resilient, high-yielding maize hybrids for vulnerable regions in South Asia.